Las Vegas is a big trade show town. The convention center, where this week's show is being held, is large and there are other convention centers and exhibit spaces up and down The Strip and around town. It's safe to say the locals around here are used to big crowds of people, week after week milling around the convention center and the restaurants and bars. But, just to give you an idea of just how large AHR Expo has become, a cab driver working the convention center sums it up best: "I don't know what this show is, but it's one of the biggest I've ever seen." That speaks volumes. AHR Expo says it's a place where 60,000 professionals gather. The revised estimate, however, is 70,000 plus!!! Of course, I say bring on the crowds. Sure, it might make my job of running from booth to booth, visiting with the various industry thought leaders more difficult, but it tells me this industry is interested in learning. If you attend the AHR Expo, you're here to learn in one way or another. 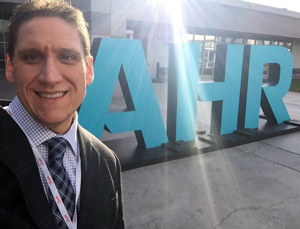 Between the ASHRAE courses, the seminars put on by AHR Expo, the various new product demonstrations or even the networking with fellow professionals, you're going to come away having learned something. And with so many people here in Las Vegas to learn, the future of this industry is bright.